Golf lesson with David Oates. 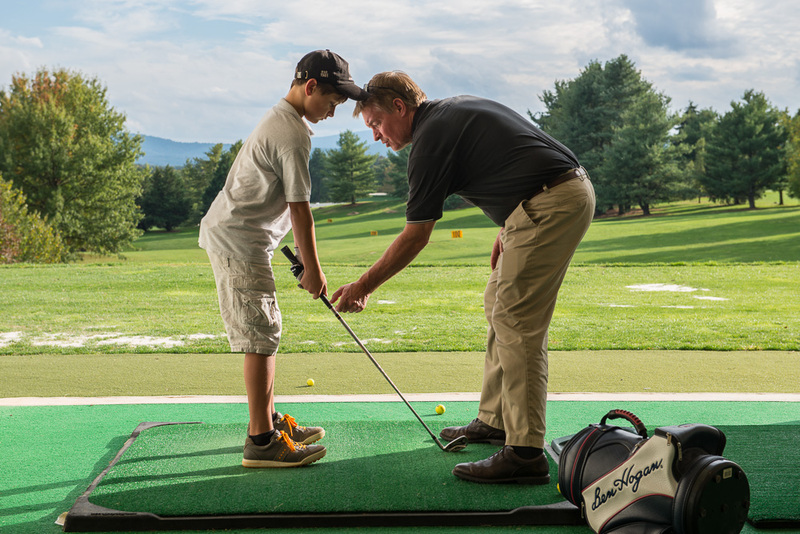 Each Wednesday I enjoy watching Cameron take a golf lesson with David Oates, the resident professional at the Shenandoah Valley Golf Club. On this evening, while Cam diligently worked on improving his swing, I worked on improving my own skills with a new camera. I’ve lost track of the many years my D2H has served me, but it now has more than 126,000 shutter actuations and is showing its age. It’s been a great camera and has traveled many thousands of miles with me, capturing images of horses and riders from the United States and Canada to Europe and beyond. These photos hang on people’s walls, in galleries, have been in countless magazines and have even won a few awards. But over the past eight years camera technology has improved tremendously, so my 4 megapixel D2H is now rather obsolete, even as a back-up camera. Its replacement is much smaller in stature, boasts 32 megapixels, has HD video and is less expensive than my D2H was new. Amazing! From my research on this camera, a D800E, I understand there’s a pretty steep learning curve, so I welcome critiques and comments along the way. Let the lessons continue! Indeed your D2H has served you well ! But now you have the absolute latest and greatest…I am so envious (in a good way). Congrats to you Tricia !!! I would love to upgrade to the D600 or the D7000 although the D800E would do quite nicely also! I can’t get over the clarity of this photo. I feel like I am there in the tee box! Thanks, David! It’s a cool camera. So far limited shooting as I had a job last week using my other camera. I hope to play with it a bit more this week. Definitely a bit of a learning curve…I’m spending more time with the manual! Ha ha!